If you’ve been reading the Crochet me blog (links: here we come, day 1, photos, moment, day 2, day 3), you know eight Crochet me magazine designers were in LA last week. We were taping five episodes for Uncommon Threads, a new show coming out next year on the DIY Network, and having a blast. There were three of us on each esispode, so each of us appeared in either one, two, or three of the five episodes taped. This is a long post because I didn’t get to blog while we were actually in LA, so I’m giving you the whole trip in one shot. I was the last of the group to arrive. Partially because I was the only one coming from the East Coast and also because I wasn’t taping until Friday, so it wasn’t necessary for me to be there early. My flight was supposed to touch down in LA at 9:34 pm, but my plane was delayed by weather. When it finally arrived, they had to repair the radar. 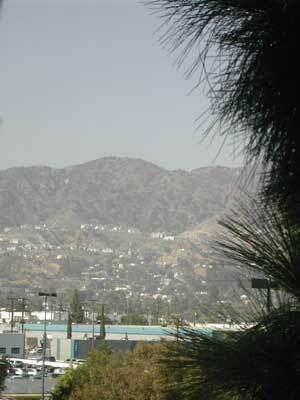 Once in LAX, the PrimeTime shuttle took me to the Burbank Hilton. I finally crashed in my room at 1:30 am (4:30 am my time), quietly but unsuccessfully trying not to wake my roommate, Julie. I tried to sleep in the morning, but my body was ready to get up; it was still on Eastern time. Josi, Julie, and Tiff taped early morning, and Cecily, Chelle, and Marlo taped late morning. I spent most of the day with Kim, hanging out, chatting, and crocheting. It was fantastic. We talked, laughed, and shared. It was like we were old friends even though we’d never met in person before that day. 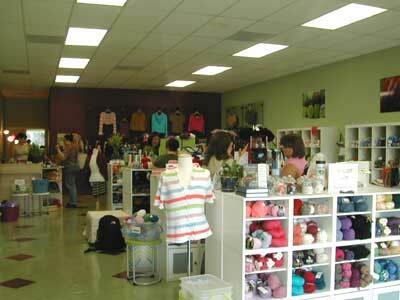 In the evening, our entire group went to Unwind to shop, chat, and crochet. It was great fun! I was tickled to find something special to buy. After a good while at the yarn shop, our tummies were grumbling, so we went to an Indian resturant. We ate and stayed far too long, talking, talking, talking, and having a great time. 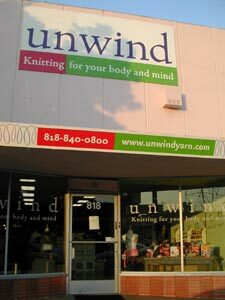 The Crochet me group at Unwind. Back row: Tiff, Kim, me, Marlo, and Julie. Front row: Chelle, Josi, and Cecily. Tiff and me at Unwind. Kim, happily making a purchase at Unwind. After breakfast with Kim, Josi, and Shannon (her group was there taping other shows), I walked over to the studio with Kim and Josi. 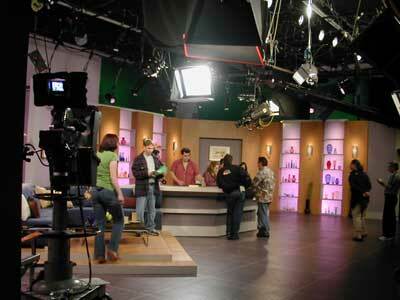 We hung out and enjoyed the atmosphere and dressing room while the rest of our group taped two shows. Julie, Marlo, and Tiff taped in the morning and Cecily, Marlo, and Julie taped in the afternoon. Our name on a dressing room door! 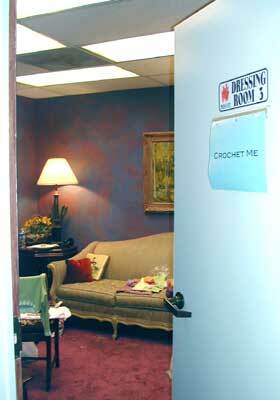 The Crochet me dressing room. 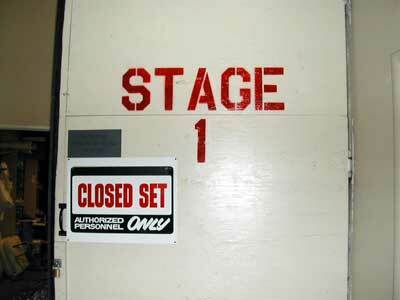 The stage door to the Uncommon Threads set. The Uncommon Threads set. 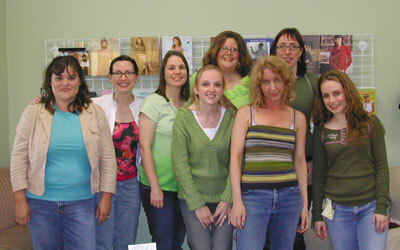 Julie is to the left in green and Cecily is behind the counter. 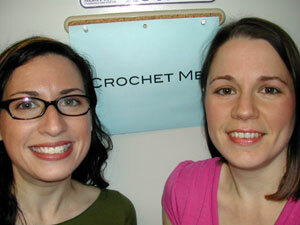 This was the final day for Crochet me taping. Kim, Cecily, and I were the only ones there, so the dressing room was quiet and low-key compared to the bustle of previous days. Kim and me in our dressing room. Is that makeup?? 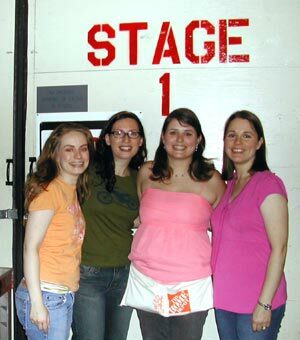 Cecily, Kim, Lettie (our segment producer), and me at the stage door. Woo hoo, we’ere done taping! The PrimeTime shuttle arrived at the Hilton at 5:10 am to take me to LAX. 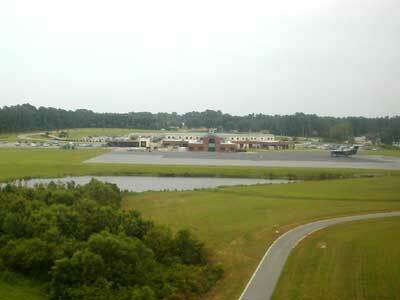 After a long day of traveling, I touched down at my quaint little one-gate airport at 6:30 pm, Eastern time. 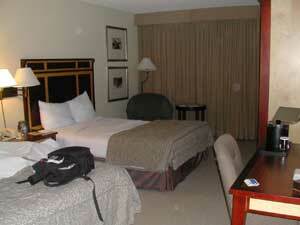 A last look at my room. Julie had already left the day before. 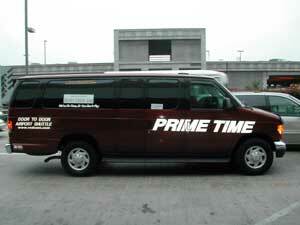 The PrimeTime shuttle drops me off at LAX. 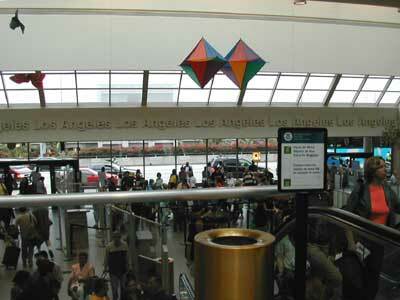 Waiting to go through security at LAX. 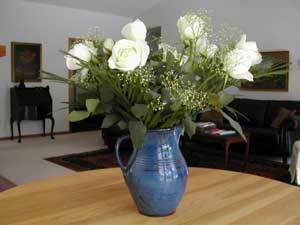 My husband greeted me with a dozen white roses at the airport. It was fabulous to return to a home-cooked meal, including fresh salsa made with tomatoes from our garden. The next day I opened a bag of Dove chocolates, and if you’ve ever had them, you know they have little sayings indside the wrappers. The first two I pulled out said, Make “someday” today, and Test your limits and keep going. I think that says it all. I’m exhilarated and proud and I’m tearing up a little bit just writing this last part. Many thanks to Kim and everyone who made it possible for me to be a part of this! Awesome post! A+++++++++. You actually made me tear up at last comment as well. Great photos. I’ll just delete my blog post and direct to yours. Crochet has sat on the back burner for such a long time…thanks for bringing it to the front burner where it deserves to be. I hope I get to see what you taped! How fab for all of you, can’t wait to see the show. How hopelessly romantic of your husband. How very cool, Donna!!! I look forward to seeing the show! I am so excited about seeing this show! Great post! I’m getting goosebumps just reading this! What a fabulous time!!! It looks like all of you had a wonderful time. I really looking forward to seeing the show! Just reading about our trip made me tear up! It was so much fun to meet you and everyone else! remember to let us all know in plenty of time so us cheapies (okay me) can go out and get cable for the duration of this show!!! sounds like you gals had a fab time!!! i soooo wish we got the diy network, i dont even know if we can get it on our cable up here in vancouver. great post!! Sounds like you had a blast out here in my homeland. Very cool! That looks like a great trip! I had a lot of fun reading Kim’s blog about the trip and was glad to see you pop up on Bloglines. :) I’m so glad you and Tiff are home! but damn! that tomato is killer! 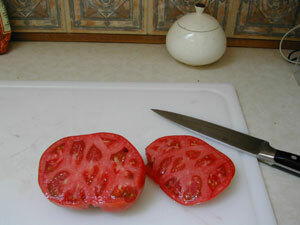 the sad tomatoes i just bought at the store look so anemic in comparison… i envy your tomatoes! Wow! What a great trip – sounds like you had a fabulous time! I will have to have someone tape the show for me so I can see it next time I go back to the States! Wow! Congrats on your taping. That is too cool Donna! Wow, What a fun time you gals had! Congrats on the show, I really can’t wait to see it!! WOW, what a great experience of a lifetime for you – deserving one too for all you do. Way to go Donna! you all looked so pretty. WOW!!!! Congratulations! I am soooo jealous! (but very happy for you!!) I have written to DIY and HGTV for a couple years now, wanting to be a guest (or host-ha ha) of a show about CROCHET! 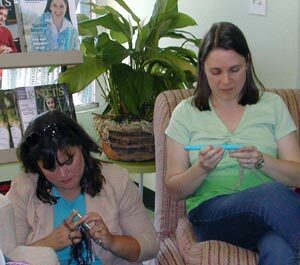 I’ve always told them “You have TWO shows about knitting, but nothing about crochet! I’m going to have to get Satellite again! I miss watching DIY!! WAHHHHH!! We just have cable now, and don’t get it, but at least we do get HGTV. Well, congratulations – I am so excited for you! What a wonderful opportunity. I’ll have to get someone to tape the show for me. God Bless! What a great trip, loved reading about it….I haven’t seen a post in some time now?? ?